Verge has been struggling to hold onto its price levels this month; it’s already down 30% from the 65% surge it had at the end of November when the Bithumb exchange listed the asset on its platform. News this week that the Australian crypto payment gateway platform, ‘Living Room of Satoshi’ integrated XVG to allow citizens to pay their house bills with XVG has done little to attract new support to slow Verge’s decline. Popular motocross brand MX4Life also failed to captivate the crypto community when it added a new XVG payment option for its clothing apparel website four days ago. Bulls have even been slow to respond to TokenPay’s recent announcement that Verge will be one of three free trading pairs available on the new eFin DEX scheduled to go live next week on December 19. It seems that short-term traders have only shown interest lately when the asset has been listed on major exchanges - riding the intraday pump and then cashing out in droves into more secure coins. Unless longer-term HODL’ers start to return to XVG soon, it’s likely that Verge will struggle to maintain altitude in the market over the rest of this year. Right now XVG is down 3.30% against the USD and barely in the green with a mere 0.11% gain against BTC. On the 4hr XVG/BTC chart, we can see that Verge recently broke bearish out of a three-month-long pennant shape, after mounting selling pressure broke through the uptrending support on November 9. The asset then collected along the 145 Sats level below before spiking 65% to 239 Sats off the back of the Bithumb listing. 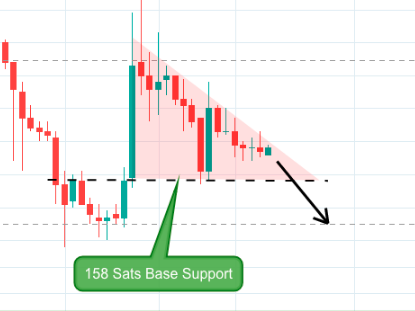 Heavy sell-offs from intraday traders brought the price down to 194 Sats at market close, and from there it has been steadily declining against a newly established downtrending resistance level. The price action now appears to be tracking inside a bearish descending triangle (see below), along a base support at 158 Sats. So far, the asset has recovered off this level once last week, on December 7, but overall, bears still appear to be firmly in control. We are expecting XVG to continue consolidating inside this pattern until eventually bearish traders overwhelm the base support and force the price down to the next support at around 145 Sats. -There is a bearish T/K divergence on the Ichimoku indicator, with candles still closing beneath the resisting kumo. -The Parabolic SAR is still showing indicator dots above the price action signaling that the trend remains favorably bearish. -We still have a bearish bifurcation between the 13 and 34 EMA lines. -RSI is showing a downtrend towards the oversold region below as buying momentum declines. From the indicators, it seems that Verge will continue downtrending until it either reaches a low enough price point to attract new bullish support, a new major exchange lists the asset on its platform or long-term traders re-enter the market.